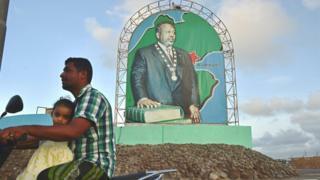 The road to Djibouti's presidential election on 8 April has been filled with tension and opposition claims of foul play. But with no strong challenger, incumbent President Ismail Omar Guelleh is widely expected to win and continue his tight hold on power. The president has been in power since 1999 and is only the second president the country has had since independence from France in 1977. The opposition are angry that the president rescinded his earlier decision not to seek a fourth term and some parties have chosen to boycott the election. The reaction from the West to these developments has been muted. Djibouti borders Eritrea, Ethiopia and Somalia and is generally seen as a relatively stable country in the volatile Horn of Africa neighbourhood. Many observers say the West doesn't want to rock the boat. "Every day Paris and Washington criticise Burundi but when it comes to Djibouti, silence reigns," opposition spokesman Daher Ahmed Farah told French radio. The opposition feel that only foreign countries can put pressure on the government but are looking the other way because of their interest in Djibouti's geo-strategic position on the Gulf of Aden. Such is the importance given to Djibouti's position that it hosts France's largest military base in Africa, the only US permanent base on the continent, as well as bases for China and Japan. Saudi Arabia is also planning a base there. This military presence signals a vote of confidence from world powers. The bases, along with Djibouti's port at the centre of a major shipping route, are the main sources of income for the country. Djibouti's opposition feel suppressed. They complain of police brutality against them, and say they don't get fair media coverage. But they are also weak. The main opposition coalition, the Union for National Salvation (USN), has witnessed many splits in its ranks and ethnic allegiances threaten its unity. Three of the seven parties in USN have decided to boycott the polls entirely but the others will participate. Independent candidates are equally weak and do not pose any real threat to President Guelleh. The constitution was amended in 2010 to remove the two-term limit for the president and reduce the presidential term from six years to five. These changes allowed Mr Guelleh to contest and win a third term in the 2011 polls, which the opposition boycotted. The president vowed it would be his last election but has now changed his mind. State media have been touting what they say is public enthusiasm for the vote and its democratic legitimacy. The US travel advisory for Djibouti, on the other hand, warns of "a possibility that spontaneous protests will occur during the election cycle and some could turn violent". The Djibouti Human Rights League said 29 people were killed when police fired at an unrelated religious demonstration in December. There was violence after the 2013 parliamentary elections, which the opposition claimed were rigged. In response the government launched a crackdown on its opponents. It later signed an agreement in 2014 to restore peace with the opposition. But the government again alienated the opposition by failing to implement reforms to the electoral commission, as stipulated in the 2014 deal. There are six candidates running for president. To win, the president must have an absolute majority of votes. A second round will be held if there is no clear winner. President Guelleh is the flag-bearer of the ruling coalition, the Union for a Presidential Majority. His coalition is fraught with tribalism and bickering. The candidate for the main opposition USN coalition is Omar Elmi Kaireh, a Djibouti independence hero. Mohamed Daoud Chehem is representing the Djiboutian Party for Development, a splinter group of the USN. There are three independent candidates: Djama Abdourhaman Djama, Mohamed Moussa Ali alias Tourtour, and Hassan Idriss Ahmed, a former diplomat, have also announced that they are standing for election.